The easiest way to explore Gozo, one of the islands in Malta, is through one of the hop on hop off tours. There are two companies that compete so you can barter to try to get the best price. Once you get off the ferry you'll be bombarded with people trying to sell you the best deal. One of the sales guys actually offered us a pretty good deal, but we had just arrived and hadn't been able to see the prices offered elsewhere. We actually would have saved a few bucks had we purchased the ticket with the sales guy inside, but he was really aggressive with his sales which kind of put us off. We ended up paying a little under 20 Euro each for our tickets once on the bus. Once on the bus, we learned that Gozo is next to deserted in January. It was kind of awesome, but also kind of strange. The homes were deserted, construction was halted for the winter, the entire island was just void of people. 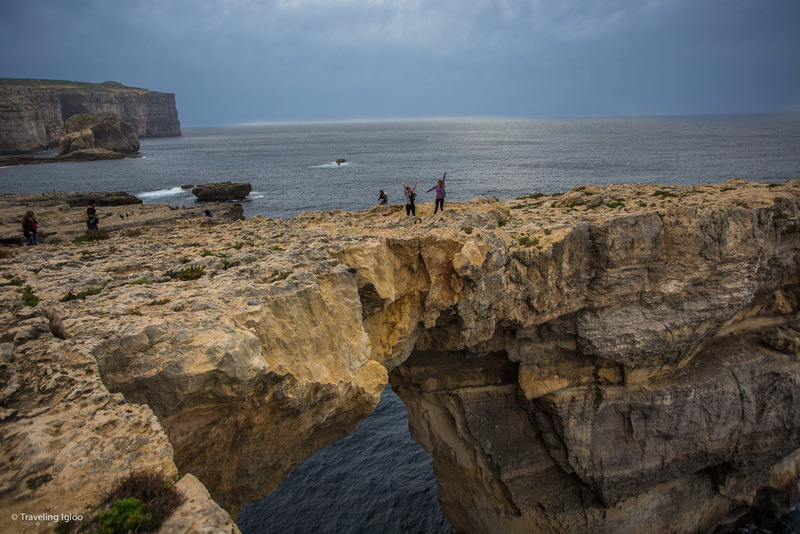 One of the highlights was the Azure Window. We were able to walk all around and over the 'window'.